This location has permanently closed. 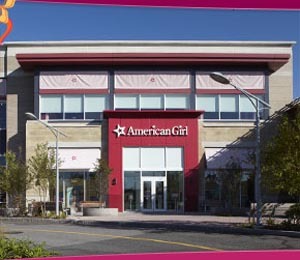 Boston's American Girl store is at the Natick Mall, just a few miles west of the city. Girls can enjoy their favorite shops, casual dining in the Bistro, and extra-special celebrations. If you are planning on enjoying a meal while visiting your store it is strongly recommended that you make a reservation and plan your day around your dining experience. If you want your day to include a visit to the doll salon for your doll complete with ear piercing this service is usually a first come first serve basis. When you line up to be checked in for the salon you will get to look at either a book or a poster of the style’s offered for your doll. You can add the Spa Deluxe service where your doll receives a head to toe cleaning, a professional hair styling and to take home you get the nail stickers, a terry wrap, Spa slippers, cucumber stickers for your dolls eyes for doll play at home and a face mask sticker so you can continue the spa experience at home. (Approximate Price) $30 per girl and $20 per adult, excluding tax and gratuity. For girls ages 3 and up. Call 877-247-5223 for party reservations. Each location also hosts numerous seasonal events at the store. Check the website to find out more about the upcoming schedule. Monday–Thursday: 11 a.m. - 5:00 p.m.